The "Classic Motor Sport Tour" includes visits to Goodwood Revival, Donington Grand Prix Collection, Grand Prix Historique de la Vienne, Manoir de L'Automobile and Museum de L'Automobile at Le Mans and, for a farewell dinner, Atelier Renault on Champs Elysees. Also included are city tours of London and Paris, Classic Team Lotus Works tour and Brands Hatch race master (with an opportunity of a drive in a high performance Renault). This great tour includes return economy air fares, departure tax, transfers, 13 breakfasts, 3 dinners and 13 nights accommodation. See the brochure for more details ..... here. Bookings close Wednesday 25th June, 2008. Telephone Sheryl Poulter at Preston Travel on (03) 9470.4737 for enquiries and bookings. A Bentley Motors apprentice team has won a special “Spirit of Greenpower” award for its performance in the Greenpower Corporate Challenge which took place at Goodwood race circuit, in England, a fortnight ago. 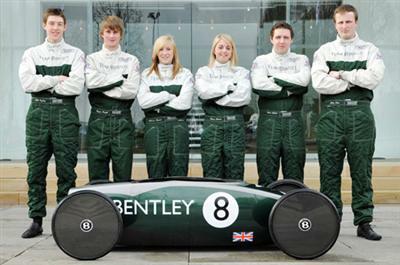 The Bentley apprentice team designed, engineered and built the electric powered car which they entered into the Greenpower Challenge as well as a season of “F24+” racing. The Bentley Greenpower car is called Continental DC (Direct Current) and runs off a 24-volt motor supplied by two 12-volt batteries. Designed for lightness and maximum power efficiency the one-seater Continental DC has a carbon fibre chassis and low resistance tyres. Greenpower is a series of events which aims to promote greater interest in young people to follow careers in the fields of engineering and technology. The 2008 Greenpower corporate challenge held recently was the first race of the season. Twenty five teams entered, comprising 15 school entries and 10 company teams. The Bentley team achieved their goal of completing the four hour race, despite some technical difficulties in the first section. The award was given in recognition of their excellent team spirit which they showed in overcoming these initial technical challenges. The F24+ season consists of eight 90-minute endurance race events which will culminate in a grand final at Goodwood in October. Race tracks on the F24+ schedule include Dunsfold, Rockingham, Croft and Aintree. Having taken the initiative themselves to compete in the Greenpower challenge the apprentices have devoted weekends and evenings for the past ten months taking full responsibility for all aspects of the car’s development. Three team members acted as drivers on race day, the rest of the team provided essential back-up support in the pits. Tom Hodgson, Greenpower team manager added, “In building the car we pooled the expertise and resources from across the business to produce a project of which we’re all proud. Having completed our first race we now know what we have to do to be successful for the rest of the 2008 Greenpower season. The experience of developing a project from idea to race-day was exhilarating. It was also hugely satisfying to see the positive support from sponsors keen to help the Bentley team”. - Top speed of 64 km/h (40 mph). o Rear grille matrix in chrome finish. Greenpower Chassis, Design & Electrical. Greenpower Team Marketing, Website, data logging and telemetry.